Drawing a dotted line is easy in Illustrator. You just change it in the stroke palette. You would think it was just as easy in Photoshop but it is a little bit trickier. This short tutorial aims to show you how to quickly make a dotted or dashed line in Photoshop and then apply it to a curve. Open your brushes palette by going to Window > Brushes, or hit F5 on your keyboard. 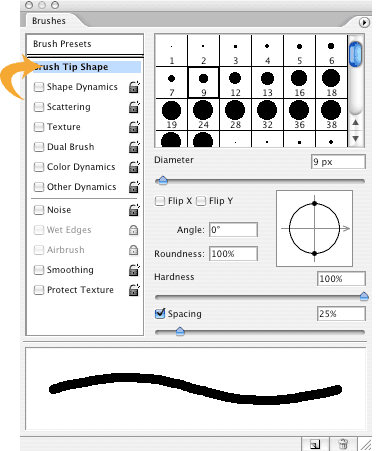 Once open, click on “Brush Tip Shape” within the Brushes palette and select a brush like 9px. The Brush Window allows you to make changes to the appearance of your brush in Photoshop. Note: You may need to reset your brushes - in the top right hand corner of the palette under the cross there is a little down arrow with three lines to the right of it. Click this and there is a flyout menu. Choose “Reset Brushes…”. You should also make sure all the options to the left are un-ticked. Adjust the spacing to achieve the desired effect in this example we set the spacing to 200%. The Brush Window shows brush spacing set to 200%. 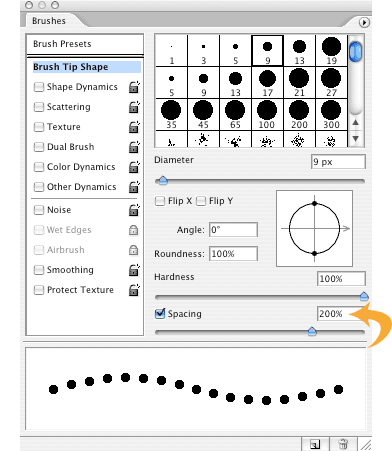 With the brush or pencil tool, hold shift, drag and bam, perfectly straight dotted line. Draw a perfect straight dotted line using the brush tool by holing the shift key down. Draw a curve using the pen tool, click and drag to create a curve you can then edit with the Select Tool. Right click your path and select “Stroke Path…” from the menu. You will then see a popup box appear. Select Pencil or Brush Tool from the list and click OK. Select the Tool to use for your stroke. The final result shown above with a dotted line following your path. I would have never thought that you would draw the line first then go back and add the spacing. It is not the most obvious process, but it is easy nonetheless.